If you're as busy as the rest of us during this time of year, you are in dire need of something refreshing, easy on the mind and simple to create. Try this garden to table cocktail recipe using as many ingredients as you can from your own indoor garden. What’s more fun and healthy than being able to grab a lemon, lime, or orange from your very own indoor citrus tree? Citrus plants can easily be grown indoors in a container and they will produce fruit as well as give off a refreshing fragrance. You can start these plants indoors in pots and then transfer outside when the weather is warm, or keep them inside permanently. Maintaining the plant in a container minimizes the shock involved with transplanting and allows you to control their growth (in case you don’t have space for a 12-foot tree inside). Citrus trees like soil that is well draining so their roots don’t sit in water for too long. Putting Styrofoam peanuts or rocks in the bottom of the container helps retain the water while allowing the roots to stay dry. Citrus trees like a specific amount of watering. If you scratch just under the surface of the soil and it’s moist, then the water level is correct. Overwatering can lead to weak roots and open the door to diseases. If the leaves are curling, are muted colors, or starting to drop off, then the plant needs more water. It’s best to keep a consistent watering schedule of about once a week in the winter to ensure the tree maintains the right amount of moisture. These trees like a lot of sunlight, so choose a spot where they’ll get an adequate amount. A grow light can supplement for sunlight if there’s not a sunny-enough spot. A fertilizer specifically for citrus, fruit, or nut producing plants is recommended because these will have the right mixture of nutrients for fruit production. Follow the directions on fertilizer packaging for the frequency and amount of fertilizer to be used. If you’ve ever wanted to try your hand at growing a citrus tree, come down and see us! 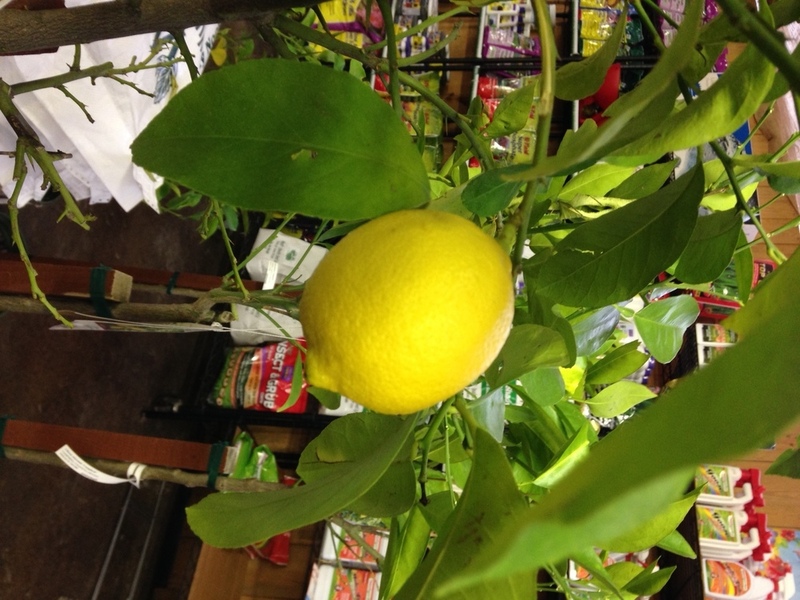 We have a selection of lemons, oranges, and limes to choose from and one of our friendly associates can help you get started growing your own citrus fruit. We even have some plants that are currently producing fruit to choose from!